MV Kolkata soon after the explosion on Saturday. 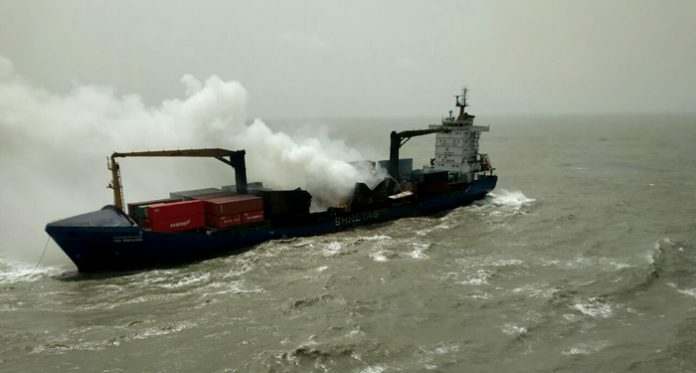 Kolkata: A team comprising a Navy commando and private sailors today escaped an explosion in merchant ship MV Kolkata abandoned mid-sea in Bengal after a fire broke out in the ship two days ago. 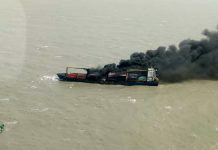 Despite the explosion, the team has managed to drop the starboard anchor of the ship in the sea waters, and in turn, stop its drift towards the Bangladesh-end of the Sunderbans forests. A Marine Commando of the Navy and three crew members of MV Kolkata were winched down on the ship by a Sea King 42C helicopter today forenoon as part of an operation to anchor it mid-sea. 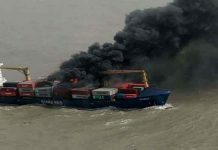 As soon as they dropped the starboard anchor from the ship, an explosion took place in one of the goods containers in the ship that was on fire since Wednesday night. The explosion is supposed to have been caused by some hazardous chemicals being shipped in a container. Thankfully, immediately after the explosion, the Sea King 42C helicopter retrieved all the four members of the team from the ship and flew them to a safe distance. A little later, a fire started afresh in the ship as a result of the explosion. The team had to hover in the sky above the sea for the fire to subside. They were then winched down on the ship again, allowing them to prepare the seamanship gear for the ship to be towed to nearest sand heads, if required, over the next few days. Naval Officer in Charge (West Bengal) Commodore Suprobho K De has confirmed that the team has been successful in arresting the drift of the ship off the Sagar Island in South 24-Parganas and it will now be salvaged by the owner Shreyas Shipping & Logistics in the next few days. The challenge now is to ensure that there is no oil spill in the sea while carrying out the salvation exercise. An oil spill from the ship or its capsizing will cause serious ecological damage to the Sunderbans forests, which is home to the Royal Bengal Tiger and several other wildlife species. Apart from the Sea King helicopter, a Dornier aircraft, and the anti-submarine warfare corvette INS Kadmatt were also engaged in the operation to anchor the merchant ship.